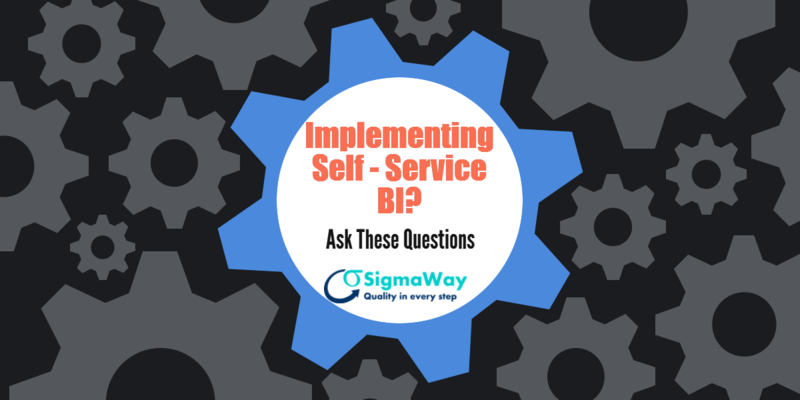 SigmaWay - SigmaWay Blog - Implementing Self Service BI? Ask these Questions. Data driven decisions are a must in today’s world. As technological progress is being made every second, the reliance on BI is also increasing. Now people are moving on to Self Service BI. But the question is: Are they making better decisions as a result of it or are they failing in its implementation? 1. Do you have the right data sources? 2. Do you have the capability to warehouse your data properly? 3. What analytics solutions do you have on hand? 4. How well does your BI solution integrate with existing platforms? 5. Is your reporting mechanism both powerful and easy to understand? 6. Does your BI solution enable better compliance? Do ask these questions before implementing your BI solution, because, correct implementation has the power to yield an ROI of $10.66 for every dollar spent.